The UE Wonderboom Portable Bluetooth Speaker can go wherever you go thanks to a waterproof design and up to 10 hours of battery life that ensures it will keep running when you need it. 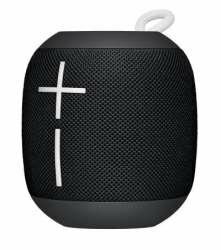 The UE Wonderboom Portable Bluetooth Speaker is waterproof, dustproof, and shockproof allowing it to be a versatile speaker that you can reliably take with you anywhere. The speaker also floats, and with a waterproof rating of IP67 you can throw it in the pool during a party or even take it into the shower.